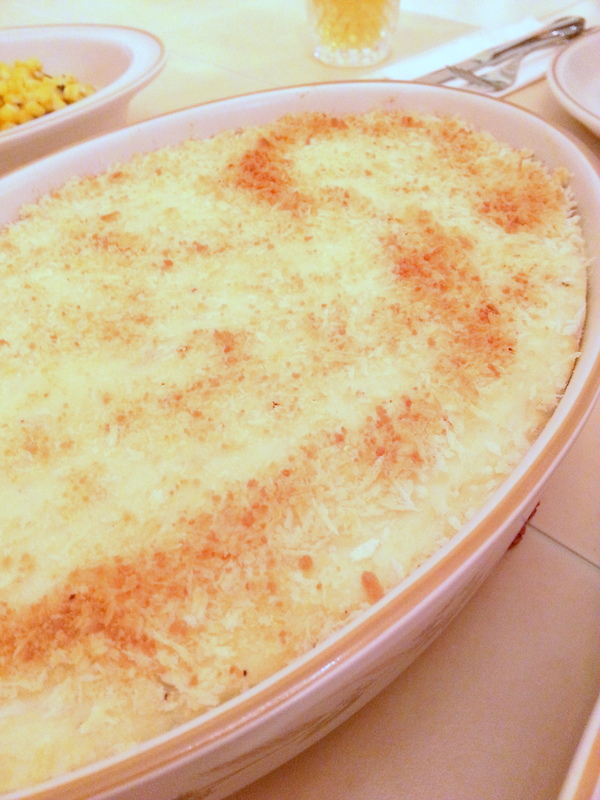 Mashed potatoes is a must-have for our holiday dinner. It is easy to buy from any store, but given that I have set myself the challenge to prepare a 100% home-cooked holiday dinner, I have to do it myself this time. This is soft, creamy, and smooth when served hot. Make sure to stir in a little more milk, cover, and reheat if you have leftovers. Grease the baking dish with 1 Tbsp butter and set aside. Peel and cut the potatoes into 1 inch pieces. Boil in a large pot of water until very tender, about 15 mins. Drain and mash potatoes in the pot. Mix in milk and butter. Stir in the 3/4 cup mozzarella and 1/2 cup Parmesan cheese. Sprinkle with remaining 1/4 cup Parmesan and breadcrumbs. Transfer to greased baking dish and bake until top is golden brown, about 20 mins.